There is never a shortage of talents who have risen to stardom in Hollywood. Some of them have risen to match the demands of their success, while others crumbled under the weight of it. Dana DeLorenzo, since she got her big break in Hollywood on The Late Late Show with Craig Ferguson, has been able to match the weight of her own success. She has gone on to star in several other projects, showcasing her talents to the world, picking up fans and financial success along the way. Who really is Dana DeLorenzo? Let’s find out. If you made the assumption that Dana DeLorenzo is an Italian-born actress who made a move to America, you would be wrong, but not entirely far off. Dana DeLorenzo is certainly of Italian descent but she was born in America in Youngstown, Ohio. Apparently, her ancestors are the ones who made the move to America. Dana was born to Phyllis DeLorenzo and Jerry DeLorenzo on the 1st of January, 1983. Dana’s entry into the entertainment world was quite early. Although she still managed to have a formal education up to college level, attending DePaul University in Chicago and earning a bachelor’s degree in Media Communications in 2005, she had begun making acting appearances since she was a child. She made her debut in a radio commercial for her father’s clothing store. When she was 11 years old, she earned money for the first time as an actress while performing in a weekly dinner show. A diverse beginning to her entertainment career included acting in theatre for the environmental comedy play, Tony ‘n’ Tina’s Wedding in the Chicago theatre scene. She got her first real shot as an entertainer and actress on a radio show titled Mancow’s Morning Madhouse. 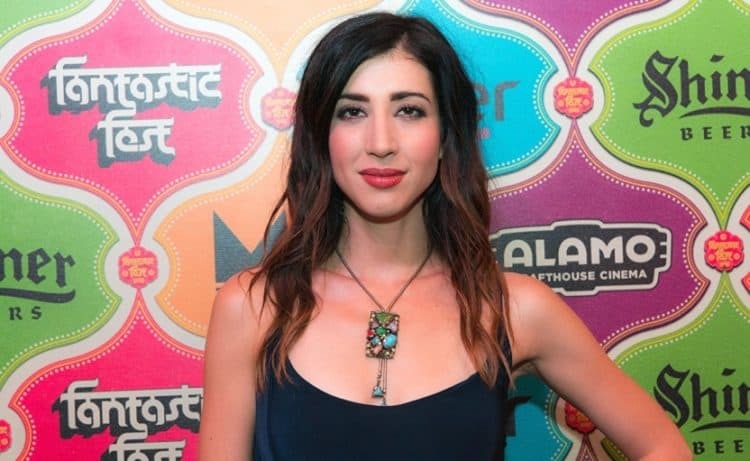 The show which she starred in as Marissa Sanchez and also produced was popular among local listeners and was subsequently syndicated nationally, giving Dana DeLorenzo her first national exposure. She appeared in a series of short films from 2004 to 2008 before she starred in a television film, Peep Show as the character Valerie. The year 2011 turned out to be the breakout year for Dana DeLorenzo as an onscreen actress. She was cast in the 2011 comedy film, A Very Harold & Kumar 3D Christmas, playing the character of Becca the P.A. In that very year, she got her television debut, appearing on an episode of 2 Broke Girls and In the Flow with Affion Crockett, a sketch comedy show. She continued to appear on television in 2012, making guest appearances on shows like Eagleheart and Workaholics. 2012 was particularly great for Dana DeLorenzo because she got a big role as the character Beth on late night show, The Late Late Show with Craig Ferguson. Since then, she has had a number of television appearances, including playing a regular role in Impress Me in 2015 and as Kelly Maxwell in Ash vs Evil Dead. Her role in Ash vs Evil Dead turned out to be one of her popular and most significant projects and equally earned her a couple of award nominations from the Fangoria Chainsaw Award. Her other television credits are from shows like Will & Grace, Teenage Mutant Ninja Turtles, Barely Famous, and a couple others. Back to films, she has starred in a few of them since she appeared in A Very Harold & Kumar 3D Christmas, including The Mad Ones and The Moleman of Belmont Avenue. Dana Delorenzo is the daughter of Phyllis (mother) and Jerry Delorenzo (father). Both of her parents are Italians. Sadly, on the 5th of June, 2018, she lost her mom to a stage 4 metastatic cancer. There is no confirmed information about Dana’s siblings if she has any but some sources suggest she has a brother named Jeremy. One of Dana’s significant credits has come from working on The Late Late Show with Craig Ferguson in 2012. While she was on the show, which featured Craig Ferguson, a popular and acclaimed comedian as host, she played the character, Beth. Her character on the show is a network executive who was attracted to Craig Ferguson’s character. The sketch involving both of them made semi-regular appearances on the show and it helped increase Dana DeLorenzo’s acting profile.